Dedicated to my Sister from another mother, Mawuena Trebarh, Granddaughter of Ghana National Anthem composer, former GIPC CEO and Sister to late Komla Dumor…a truly great Lady! 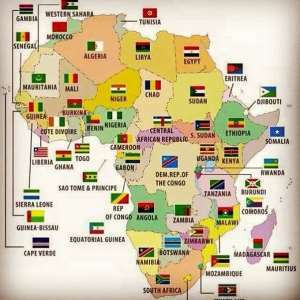 The improvement in health care and absence of social systems will boost the population rate in Africa skyrocketing in the light, Africa does not speak with one but 55 voices having a tradition of large extended families to give them comfort. 1957, Ghana was the first Sub-Saharan country gaining independence with a population of 5 Mio. people. Today Ghana has around 28 Mio. after 62 years of self-governance making it a multiplication rate of 5,6%. Projected into the future, in the next 60 years, Ghana will have a population of approx. 156 Mio. people (28 Mio. x 5,6%). Nigeria, estimated today at around 160 Mio. will be 896 Mio. people making Ghana and Nigeria alone a population of 1 Billion people. The whole of West-Africa will be between 1,6-1,8 Billion, while West-Europe (EU countries) stable around 500 Mio..
China has approx. 1,3 Billion, India 1,2 Billion, USA 300 Mio., EU 500 Mio., Russia 150 Mio., Japan 120 Mio.. These today Superpowers will have in the next 60 years a population of around 3,5 -4 Billion, while all of Africa 5-6 or more Billion people making it double the population of above-developed countries and ower houses. At a much greater pase, Africa´s natural resources will be exploited to extinction, much-needed income for the states on the continent will hit rock bottom and climate change will lead to higher cost of food production as artificial watering by irrigation will increase the price of crop production as natural rain comes for free. AID policy and loan giving of the developed world, military intervention and policies towards Africa, in general, is directed to the idea the African should survive above water but never walk on water ever. The White Man does not want to be ruled by the Black Man knowing historically he, in fact, is mandated to take the top job of this world and rule God`s people. It is not in the interest of the White Man to raise a competitor by the rights step taken in interacting with their black counterparts but blind them with smiling faces, “nice” gestures being more than happy that Black Leaders do not see their intentions through their corrupt lenses. Africa would come to its senses using the next 60-80 years wise before Africa´s natural resources will be gone for good to transform with the generated income from God´s blessings their economies like Taiwan, South-Korea, Singapore, Arab countries and Malaysia, to mention a few, the White Man would potentially find his downfall. History can never be stopped, only be delayed. Africa eventually will rule the world. For any wise Nation, it is an act of wisdom to start now an honest and deep relationship with Africa. Once the White Man´s countries will line up to greet the new World Ruler, the wise country will be the first in his heart and benefit from the friendship over other Nations. Germany: be that Wise Man.